Anyone know of or want to sell their bike?? Ideally I am looking for a 750 Breva or a V7. I live in Grantham and have about £3k to spend. To be honest mate if I were looking to sell my V7 (and I'm not) I'd be looking for about £3750.00 just to give you some idea. Cheapest V7 I've seen was £3300 in dealer or £3100 or ebay. Not many about at that price, and not surprisingly, they sold quick. Thinking about Breva 750 in dealer in Northampton at the moment, although 'her in doors' said it was OK to buy a new V7 special (I was offered one with £1k off); but there again her financial comment sense originates in La La land. I only want one as a toy really and I can't bring myself to go into debt to buy one. Thanks to members who pm'ed me with offers of bikes. I've found something now - 750 Breva. Picking it up week tomorrow - very excited!! 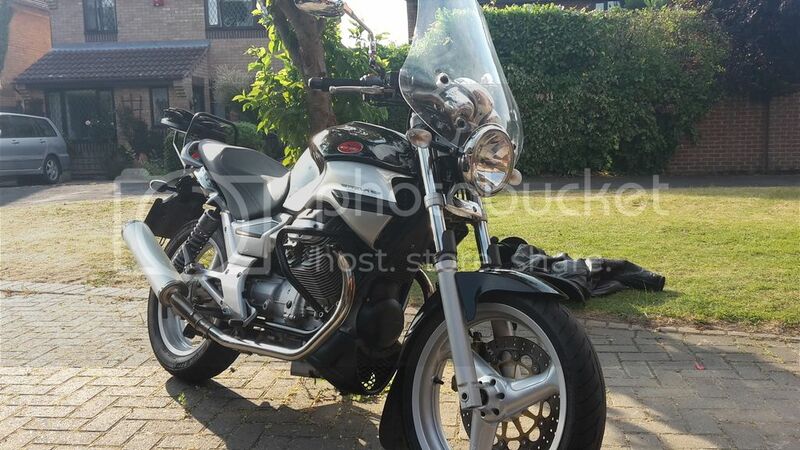 This will be my first guzzi after years of BMWs - I think I'm in for a different experience. If it is the one ,breva 750 ,at Mick Berrils I heard it is a real corker low.low miles too. I did think about that one - I asked for a discount and didn't get it. I found one in Cheptow for less money, but it is not as good cosmetically. Same age, same miles, but with a higher screen (does not extinguish my pipe) pannier frames, mistral exhausts. I'm just getting used to it - it likes to pull from low revs I've noticed. I'm also delighting in the fact that I can get it out of the garage, around the front of my car by tilting it towards me; something that I would not have attempted with the BMW. When I've got time to fiddle about I'll post a photo of it. Paint is a little peely in places.